Have you seen Clara of Depression Coooking with Clara on the news lately? She is 93 years old and has her own blog and several videos on youtube. With the downturn of the economy, people are very interested in being frugal. Clara shares recipes and stories from her own life during the Great Depression. I watched her youtube video on making bread. I’ve altered it a bit, but not much. Clara says she uses 5 lbs of flour, 2 oz. of cake yeast and water. yeast – I used 7 Tbs, but I think I could have gotten by with less. Maybe 4-5 Tbs. salt – I used 8 tsp., thinking I would need about 1 tsp. per loaf. This was a bit too much salt. Next time I’ll go for about 6 tsp. Clara doesn’t mention salt, but I think the loaves would taste flat without it. warm water – About 6 or so cups, but you need to go by what the dough needs. I followed Clara’s direction to dump the flour in a large bowl. I then mixed in the salt. Make a well in the flour and put the yeast in. Start pouring warm water into the well. Mix the yeast and water with your fingers to dissolve. Start mixing in more flour with your hands, adding water as needed. You will eventually end up with a great big bowl of dough. After I got all the flour mixed in and I kneaded it in the bowl for a bit, I dumped the dough on the counter and washed out the bowl. I sprayed the bowl with cooking spray and put the dough back in, turning it to bring up the oiled side. I’m not sure how Clara handles this step, but it’s the way I like to do it. If I knew the dough wouldn’t stick to the bowl, I would have just left it in the bowl to rise without washing and oiling it. Let the dough rise in a warm place. 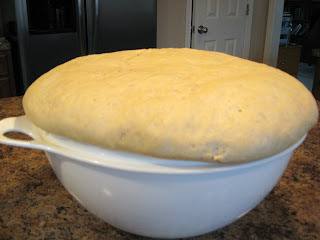 Cover it loosely with a clean towel while it rises to keep the dough from drying out. After it’s risen, punch it down and divide it up for loaves. I was thinking that this amount of flour would make about 8 loaves. Some of the loaves seemed a bit small though, so next time I may go with 6 instead. Also, I only have 7 bread pans. I liked how the loaf on the cookie sheet turned out though. Cover the loaves with a clean towel again and let them rise a while longer. Place them in an oven at 350 degrees. I have speed bake (convection oven) and I baked mine for about 30 minutes. I’ll try this again. Like I said, I need to cut back on the salt a little bit. I think that also might help the loaves rise a bit higher. The taste is good. We polished off 2 loaves in less than 24 hours! The rest went into the freezer for later. So, less than $3.50 for 8 loaves of bread. That’s pretty cheap! And no additives or preservatives, so healthier than store-bought. If you try this, let me know how it turned out for you. I sometimes turn this into “Recession Era Bread” by adding a melted stick of butter to the warm water. I LOVE making my own bread. I try to bake 2 loaves every weekend. When my son was young, My husband would make homemade New England Clam chowder and I would make bread from scratch. Surprisingly, Kids from the neighborhood would come out of the woodwork. Those were the good old days. People should check the size of the flour bags as now mine are just 4 lb. I make two loaves every two weeks for the two of us making the no knead bread. It is soooo good. Takes 6 1/2 cups of flour, two T. dry yeast, 2 t, sugar, 1 T salt (yup, that much) and 3 cups water. No oil. I proof the yeast, sugar and water. 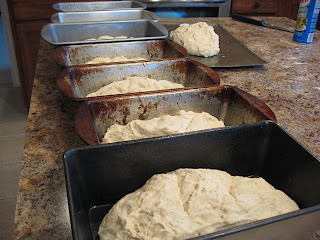 Mix all together, let raise til double, divide into 2 loaf pans oiled, let rise again and bake at 4:25 for 30 min. Yummy!!! I like to add sesame seeds, poppy seeds, or chia seeds to batter. Thank you, this turned out perfect! t or tsp. is for teaspoon and T or Tbsp is for tablespoon. Hope that helps! The recipe for the recession bread is very similar to the bread I make regularly except I add olive oil. Add a couple of tablespoons after the salt and yeast before the water. It makes lovely springy bread and keeps better. I also freeze my bread after batch baking. You can also add seeds e.g. Sesame, poppy, pine nuts etc. To add variety. My ancient aunt baked all her bread in a wood stove. She never used salt, which to my child’s palate made the bread taste flat. Wish I had some of that breas today…too old myself now to be interested in bread baking. Made my own for years when my kids were little…good! And YOU KNOW what YOU put into it so you KNOW what is going into your kids!! I’m off to check her out. I LOVE cooking staples here at home. Sometimes I just scratch my head at friends who eat out all the time and then wonder why they don’t have as much cash, time with thier family to chat or are not loosing weight (not that I am, ha ha). We went out to eat for the first time in months on Friday to celebrate our oldest daughter making honor roll. A family of 6… $64.17 before tips! And there was SOOO much food in each portion size we ended up taking home FIVE take out boxes! From now on they can choose their favorite meal and we’ll make it AT HOME! I love watching Clara’s depression cooking on youtube. A friend just told me about her last week. She made a recipe, but I am not sure which one. I haven’t tried any of the recipes yet, but I think this one would be a great one to try first. I only have 2 loaf pans though. I may be borrowing from the neighbors! LOL. Check out thrift stores to add to your collection of bread pans – very inexpensive. You can bake bread in any glass or metal pan. Wow! That is an awesome money saver! So I have 2 questions. First, can you use wheat flour in the recipe to add more fiber? Like maybe half white half wheat? And second, when you freeze your bread do you use any special wrap or bags? I’ve been wanting to freeze some since there are only 2 of us and we rarely finish a loaf. Just wasn’t sure if there is a method to freezing and then thawing. Thanks!! I only use Whole Wheat Flour. I usually add some honey and molasses as well as some oil to my recipe too. I always end up freezing most my loafs. I just freeze them in a reg. bread bag with a twist tie. It thaws just fine. For fiber….. If you like sweet breads, switch it up and add 1/2 C organic coconut oil, 1/4 C organic honey, a cup of shredded coconut, a 1/2 C green raisins as well as 1/2 C of regular raisins. You can add nuts and dried pineapple or papaya, shredded carrots or zucchini etc…. to the mix if you like. You’ll be getting a lot more fiber by adding fruits or veggies and nuts. Serve warm with honey drizzled over it. You can also add ginger or cinnamon or your favorite pie spice to the mix. Just play with it till you find something you can’t live without. Jan, thanks for the suggestions. Those all sound great! Erin – I like baking bread too. I usually make whole wheat, but I’ve been out of the habit lately. DiPaola Momma – I hear you on the cost of eating out! We always drink water to save on the cost of drinks too. It’s unreal how much it costs to eat out with a family of 6! Heidi – that’s a great idea to borrow bread pans. I really liked the loaf I baked on the cookie sheet too. Superjaxster – Whole wheat flour tends to make the loaves pretty heavy, even if you add 1/2 bread flour. Try it and see how it works. If you do, let us know how it turns out! As far as freezing the loaves, I just wrapped in foil, but we go through them fast. If it was going to be in the freezer longer I would have used heavy duty foil or ziplock freezer bags. Just thaw them out on the counter. I’m definitely going to try this. In fact I think I will buy the flour today since I don’t have a full bag right now. The loaves are on the small size and don’t last! I divided this recipe into 6 loaves intending them to last the week in my family. The kids smelled them coming out of the oven Sunday night and only 5 loaves made it to Monday. What a fabulous post! I am going to go watch Clara right now. The bread looks yummy, there is nothing like homemade bread. How awesome is that! I love all your step by steps.. Just stumbled upon your blog.. nice to meet you! yum…kind of reminds me of Irish Soda Bread….which is totally on my menu tonight….. I make Irish Soda Bread more often than yeast bread because there is no kneading or rising time. It goes great with beat stew! There’s nothing like the aroma of of yeast bread baking though! Man, I love bread, too bad my hubby and I decided to cut back. Looks like a great recipe. I went home last night and made 6 loaves of bread from this recipe. It was very simple and turned out delicious. The only minor issue is that my biggest bowl could have been bigger! That’s A LOT of flour…LOL! That is so cool to have Clara around teaching us what she did during the depression. I will have to try the bread. I would oil my bowl too. I always have because I don’t want it to stick. As for the Key Lime juice…you can buy the key limes in the produce section and juice them (all 28 of them) if you want to, but I use Nellie and Joes Key Lime juice from Key West(in a bottle). Not sure if your Walmart has it, mine does not. You can get it at Kroger or a Wholefoods store. It is great. I do not use Persian limes because they seem too bitter to me. Key limes are the little small round ones. Wow…that’s interesting. I’ll bet Clara could teach me a lot. How did you store all that bread? Thank you SO much for sharing this–I am bookmarking it to try it soon! And, thanks for stopping by my blog! I am soo going to be trying this recipe next week on my days off of work. We go through bread like it’s going out of style here at our house. I made this recipe yesterday and LOVE it! It’s sooooo yummy! I haven’t made this bread yet because I don’t have enough loaf pans. I guess I should look at the local dollar store to see if they have loaf pans. Every once in awhile I make homemade bread and my family goes crazy. I can’t wait until I am able to serve this to them. So many recipes that I want to try – will just have to pick 1 or 2 and start trying them. Being new to your website, it seems as though I found so much of the things I enjoy here! We LOVE to watch Clara!! My 6 yr. old dd will ‘request’ her!I tried making this from her video and halving it. I’m with you, it needed some salt. How do you freeze it so that it tastes fresh when you pull it out of the freezer? Thanks again for being that ‘irl’ person to try out these recipes! BRILLIANT!!! I’m so doing this! Bread makes me nervous, but I’m so going to try this!! I’ve been thinking of things to do with my girls since they are off from camp next week. Baking bread is now on my list. If you wanted to use some whole wheat flour but didn’t want the bread to be heavy you could use one half or two thirds white whole wheat and the rest plain white flour. King Arthur Flour has it in 5 pound bags, it is a little more expensive than white flour but it is very healthy. I love Clara too and am so excited she has written a book, can’t wait to get it when it comes out in October. I buy my yeast in 2 lb bags from Sam’s Club. It is even less expensive that way. I bake all my bread on cookie sheets. If you flour the bowl and the counter (and your hands) it doesn’t stick as much. I don’t mind a little sticking to the bowl when it rises. I made 6 loaves 2 days ago. My family loved it. My husband took a loaf to work today and it was gone quickly. At first when I took it out of the oven, the top was very hard but I lightly covered it overnight and by the next am it wasn’t quite so hard. Thanks! If you are using whole wheat flour and want to get a better rise out of your bread add 1 1/2 tsp of Vital Wheat Gluten for every cup of whole wheat used. You can buy Vital Wheat Gluten at you local supermarket. It is normally sold where the flour is. Here is a wheat bread recipe that I use. It turns out perfect. Add all ingredients to bread machine and run on dough cycle. Remove from machine and divide in two. Place each 1/2 in a greased loaf pan, cover with damp cloth and let rise again (about 1 hour, depending on temperature). Bake at 350 for 25-30 mins. You can adjust the ratio of white/wheat flour if you prefer. If you do all wheat flour, you might need to run it through the dough cycle twice as it can take longer to rise. You can also cut back the sugar a bit. The sugar is necessary to activate the yeast so you can’t sub Splenda or other sweetner. Off to check out Clara! I do love her! I’ll have to give this one a try! I am making this right now…so excited to see how it goes! Just gave you a shout-out! LOVE the bread! This bread looks wonderful. Just may have to give this a try. I tried this recipe last week. It was a little scary because I am not good with “guesstimates” I used all whole wheat flour, some white whole wheat and some traditional whole wheat, 3T of yeast. I also added vital wheat gluten, 1/4 t for each cup. I did forget to use enough salt. But the taste was still good. I was looking for a whole wheat recipe that was dairy free and this fit the bill. Everyone (family of 5, including 3 boys) liked it. It was less crumbly than my other breads, probably due to the extra gluten. It rose well, but then sank when I took the damp cloth off. Never a good sign. But it did rise again in the pans, but didn’t rise in the oven. So the loaves were not as high as I would like. I’m going to try this again, making sure I use the right amount of salt and maybe a little less gluten. Not sure about the rising time, I did 1 hr for the first rise, 10 min rest before rising 40-45 min in the pan, maybe a little longer. I also cut it back because I only wanted 4 loaves at a time. Thanks for this recipe as it’s making me “thing outside the recipe”! I’ve a feeling the problem was the whole wheat flour. Remember that this is not a traditional bread recipe and so heavy flours will likely weigh it down, which is what whole wheat is. The purpose of this recipe isn’t really as much health, as it is affordable and to keep you alive in dark days; hence depression era. Is there any way to reduce this recipe? I’d love to try it, but not sure what we would do with all that bread! Thanks! you could easily just cut everything in half .. 2.5 lb flour etc… and get half the amount of dough..
also, someone asked about using wheat flour, i haven’t used this recipe, yet, but i do often make breads at home i find, i have great success and nice light loaves by allowing extra rising time, and sometimes a little extra water. it helps a lot to dissolve the yeast in a cup of warm water, then when foamy, add a touch of sugar, before blending into the flour. I have been using my great grandma’s depression cookbook for years. It has tons of staple receipes. Makes great sizes of things so that you can feed your army or add some to every meal. I make bread twice a week after I get home from work and we have it the very next day. My family of 5 can eat me out of house and home, but I have learned to make and bake like a real old fashioned gal. Try making it replacing 1 cup with Oats and 1/4 cup wheat germ instead of wheat flour. It seems to dryo ut less and adds some texture and flavor. I’ve been going through some of your old menus and found this one… I make a lot of homemade bread with my bread machine, but was thinking I’d like to make some dough and then possibly freeze it and then let it thaw overnight and cook so we could have fresh bread in the am? (I could also use the timer setting in my machine but its fairly noisy!). Would that work? Also, I think I have that same white bowl from tupperware – how the heck do you keep yours so WHITE – mine looks awful but I absolutely love it. Its clean but just stained and nasty looking – I would never bring it anywhere! S – I think it might work to freeze the bread dough and then use it in the machine. If you try it, let us know how it works. I’m interested in making this instead of buying store bread. I only have 1 loaf pan, though, so I’d need to freeze the dough. My question is, do I freeze it before it rises, or after? I’ve never made bread before. Thank you! Diana, I think I would freeze it before it rises. Let me know how it turns out! I put a sprinkle of sugar in it also. It was great! The whole family loved it. I would love to try this recipe but there are only 2 of us and limited freezer space. Does anyone have this recipe (or one like it) for just one or 2 loaves? Thank you! Love this site! We used this recipe for a few loaves then used the rest to make cinnamon rolls. Great way to spend an afternoon! 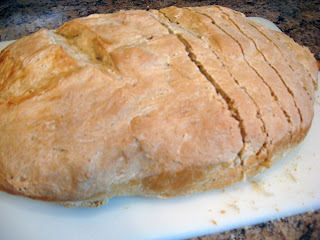 I am going to try making this bread this week. My plan is to let it rise, divide it out to rise in the pans but I will only be making 2 loaves. The rest of the dough when divided will go into freezer bags and be frozen. I figure you can buy frozen bread dough at that point in the rising process, why not just make homemade frozen bread dough? I will report back with my results! Oh yes! Please tell me how that works. I think it will be great! Hello all – When I saw this post it made me think of the bread recipe I have (which tastes great!) This recipe was passed to me from a great friend who makes it all the time. Below are proportions for one loaf. bake @ 450 for 10 min, then turn oven down to 425 & bake for about 12 min. *If you choose to use wheat flour, I would only use about 1/2 wheat flour and 1/2 bread (or all purpose) flour. it is too dense with only wheat flour. I have 4 teenage daughters who love to cook with me. 1 of them is already a favorite cook of mine since she makes up her own recipes and they always taste mazing. Since I am a new fan of this website and trying things ive never eaten before making bread with my girls is oging to be a new thing to do on Sat afternoons. We have a big family and are always in need of a new loaf of bread so hopefully this will cut down the cost each week. You probably could do it that way. It might be harder to punch it down in the pans though and the loaves might stick to the pans more. Can you make this with whole wheat instead? Julia, I haven’t tried this recipe with whole wheat but in my bread making experience, whole wheat flour doesn’t tend to rise as well as white. 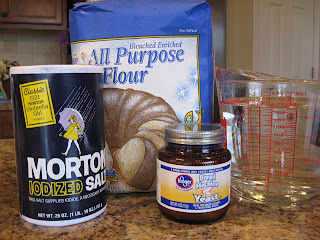 You can either use part bread flour (which has more gluten in it) or add gluten to the mixture. You might want to try my whole wheat bread recipe instead. It still isn’t 100% whole wheat though, because of the tendency for the loaves to be heavy. I was reading the comments, and I know from past experiences to split whole wheat with white flour to make it less dense. But I also have whole wheat pastry flour (for use in cakes, muffins, cupcakes, etc) and was seeing if anyone else has tried this recipe with pastry flour. Maybe a dumb question, but I was wondering if you could use whole weat flour to make this wheat bread? Would it work the same? I don’t have a lot of experience with making bread, so wanted to check first. Thank you. Karlyn, whole wheat flour can produce a pretty dense bread. When I make whole wheat, I use half WW flour and half bread flour. I’ve not tried that with this recipe before. I do have a WW Bread recipe though, you can do a search for it. The other option is to add gluten to help the bread rise better. Just FYI, salt counteracts yeast. So, the dough would have gone farther with less salt. Most bread bakers use a little salt, for the flavor, but especially to keep the yeast from over-rising. I know you know you want to use less salt, because the flavor of the salt was too strong, but just know also that any time you change the quantity of the salt, it will effect how well the yeast works. Sugar feeds yeast, salt slows it down. LOVE your site, btw!!! Great recipes! How would the dough work out if you were to divide it then freeze individually for future baking? Alisa, I’ve never tried it, but I think it would work great. If you try it let me know how it works. Well, 2 things… 1. It still rises in plastic bags in the freezer until it is fully frozen: or requires squashing once or twice. 2. It makes fantastic pizza dough, not bread after it has thawed, it’s seems freezing deactivates the yeast rise. It worked great for the Stromboli! 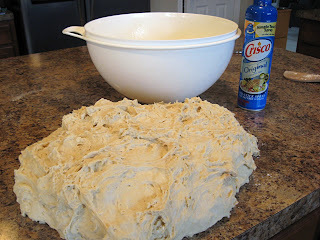 I have read that when readying bread dough from the freezer, it takes many hours to let it thaw then to rise properly. One of the suggestions was to thaw overnight, and let rise for 6 – 8 hours the next day before baking. Some even suggested a second rise. I have never done this myself. I am too paranoid. Oats and using wheat flour too. I’m just so excited I made bread and it tastes like bread. Thanks for posting this! How long would you bake it for in a regular oven? Sarah, I’d check it after the same amount of time. You might have to give it 5-10 more minutes, but it also could be done in the same time. Found you on Pinterest. I did this with our kids for a math lesson, they are 8 and under. We did grind our own grain into flour to make it healthier and more realistic.. but it was super easy and I did follow your directions regarding the lower salt and yeast. It was DELICIOUS and so easy!! Thank you.. We even turned one loaf into a pizza for lunch. oh, I’m so excited to try this. I love my pizza dough recipe from Betty Crocker, but the breads always seem so complicated. Baking with a pan of water or spritzing with water, etc. My only real complaint about bread baking, I dislike the wait-time to allow for rising. ha! Oh how I love Pinterest and how so many great recipes are spreading around via that. How do long do you wait for it to rise the first time? Jennie, it depends on how warm your kitchen is but usually about 1 1/2 hours to 2 hours. Lynn, you’re right about the sugar. I haven’t added that to my loaves, but I do add butter sometimes and call it Recession Era Bread 😉 And I’ve also made it with bread flour to create fluffier loaves too. Keep in mind that during Clara’s time the wheat was clean. Then comes Monsanto and GMO and scientists who have hybrid wheat to the point of causing all manner of immune issues..GMO also adds to the wheat allergies and auto immune disease. In light of this be sure to use organic flour/grain. I like to go a step farther and I use Emmer or Einkorn which are ancient wheats that are not hybrid. I start with warm water (Not over 110 degrees) yeast and sugar. Then if it doesn’t bubble up after 10 minutes, the yeast is no good. You haven’t wasted the whole thing. 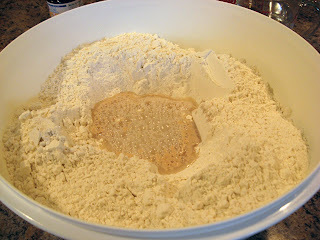 Then beat eggs and oil and add to yeast mixture…then add flour. I make dinner rolls and bread sticks too out of this one. Many bread recipes do call for eggs, but this one doesn’t. Simply because they were so much harder to come by during the depression. It turns out wonderful and my kids gobble it up! 2 oz of yeast cake is equivalent to 6-7 tsp of yeast….I envision you had some bread like I LOVE LUCY episode? Wonder if Vegan butter would work well instead if regular butter? Any thoughts from the pro bread makers? I love the article on depression era bread. I used to make bread a lot but got away from it. Think your bread is missing a very important ingrediant however. For the yeast to work it needs a little sugar. It is the yeast eating the sugar and thus making the gas that rises the bread that makes it all work. Doesn’t need a lot but does need a little. Sugar, honey, any sweetner. You’re right about the sugar. This recipe is strange that it doesn’t have any and it still works. Maybe during the depression, because sugar was rationed, they just left it out. I love Clara’s cooking. She died Nov. 29, 2013. I didn’t know that. She was a treasure. I’ve forgotten to add salt in the past and the bread is not very good without it. I typically add about 1 T for every 2 pounds to 2.25 pounds of flour. I just wanted to let you know that I halved the entire recipe and came out with four beautiful loaves of bread. I did add 2 tablespoons of brown sugar to give the yeast something to munch on but I’m not sure that was absolutely necessary. I’m glad it turned out. Thanks for sharing! I used to bake 8 loaves every week for my family of 5 kids. They considered a loaf of Wonder bread a rare treat! My mother bought flour in 100 pound bags and emptied them into a bin in her cupboard ,made just for that purpose. I made this bread it was great. I don’t think it makes 7 loves but I am trying today with just 4 loaf pans. My family liked the last batch hoping for the same reaction today. I’m trying this… I hope I did not ruin it though. I put the yeast in the well like suggested and added warm water. I tried to mix but it turned into a big clump. So then I just proceeded to make dough. I tried to make sure all the yeast lumps got broken up. 🙁 It’s trying to rise now 🙁 Let’s hope I did not just waste a bunch of food. It sounds like you were on the right track. I hope it turned out for you! Will definately try this. Thanks! Going to try this soon, love simple and cheap. Thank You for posting. I just wanted to mention that my mother always used warm potato water when she made her bread it was the best !!!! That’s how I do mine too. I’ve heard of doing that, but never tried it. Tried it last night. I managed to mess it up a little, but still came out very good. will now try potato water and a few other things. Had to proof the yeast I found in the freezer. Who knows how many years it was up there! 4 at least. Why is baking powder or baking soda not used in the recipe? Seems to me, just using salt & yeast wouldnt make it ride that well. In a bread of this type, yeast works as the leavening. No baking powder or baking soda needed. In quick breads, muffins, cookies etc., baking powder or soda are the usual leavening ingredients. I used to sell bread through a co-op so here’s some things I learned. Honey adds moisture and is a natural preservative. Molasses goes well with whole wheat, but a little goes a long way! Oats and other grains require more water in the dough. Use one large recipe like this to make several products like cinnamon rolls, hamburgers or hot dog buns, and pizza crust that you partially bake before freezing. Sandwich thins or flatbreads were popular, too! Let any bread products cool completely on a rack before wrapping and freezing, or they get soggy and lumpy. This recipe inspires me to want to bake again! I love to bake no matter if it is bread or cookies or cakes. I have made my breads for years and usually make 7 loves of whole wheat and 7 of white. I freeze them and give some away. This recipe is similar to one I use all the time so I will have to try this method. It looks good and very easy. You should refrain from the cooking spray. Maybe olive oil instead. Cooking spray is horribly bad for you. Need some sugar to feed the yeast. I don’t have a convection oven. In a electric stove oven, how long would it take to bake at 350°? I’d still check it at 30 minutes, but it may take 5 or 10 minutes longer than that. I do this with 1/3 rice flour, 1/3 tapioca flour, one third cornstarch and 3 tsp Xanthum Gum and make it gluten free. works great and TASTES great! Thank you for sharing this. About freezing bread. I live alone but do bake most of my own bread using a bread machine on dough setting and then making it into loaves , rising and then baking in an oven at 350 degrees for about 30 min. Works well for me. It is hard for me to us a whole loaf while it is still good so I freeze part of it by slicing it and then freezing it in a plastic bag – slices can be removed as needed and take only a few minutes to thaw. By far the most convenient way to go. I see a lot of you don’t have enough bread pans……..a regular 9 by 13 inch cake pan can be used. 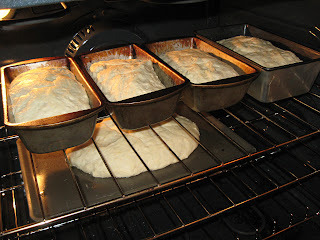 Place three of your loaves in the cake pan, let rise, and bake.